Isobel is modelling one of my sample dresses, the classic strapless Cinderella dress. 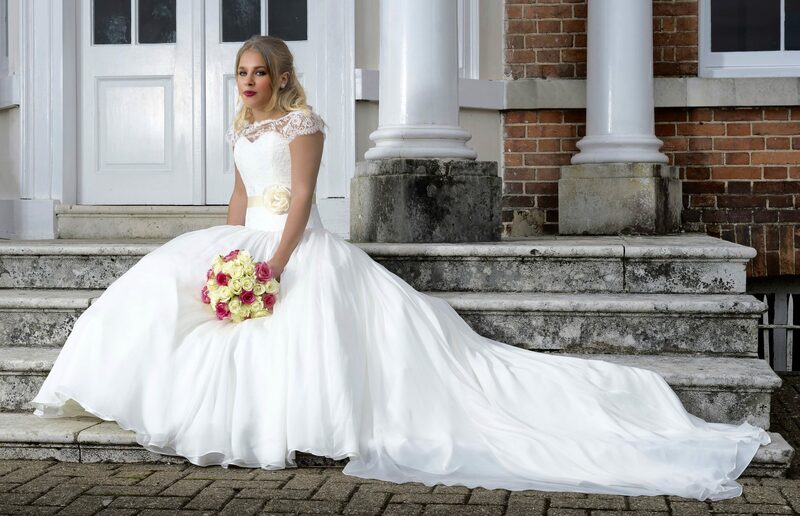 Strapless styles have long been a bridal favourite and are a flattering option for many different body shapes. The fitted bodice with accentuated waist and the billowing grace of the full skirt is quite princess like. In traditional ivory the chiffon is light and sheer and the under satin drapes beautifully, creating a lovely flattering and feminine look. This dress is lovely on its own, but so versatile it can be worn with different belts, sashes and boleros. They totally transform the dress and allows individuality for the bride to create her own look. Variations could include long sleeve or off the shoulder bolero, a lower back to the waist version of the dress, a jewelled belt and a different colour than Ivory, maybe sea-pearl, champagne or blush pink which are still very popular. Isobel is wearing the cap sleeve lace bolero made in the same lace as the dress, and a satin sash with cabbage rose detail. A separate bolero means you can cover up in church and change the look for the evening reception. The look of lace over skin is quite alluring. We had fun on our shoot day, photos taken at Square One Studio near Reigate, and East Court Mansion, East Grinstead.